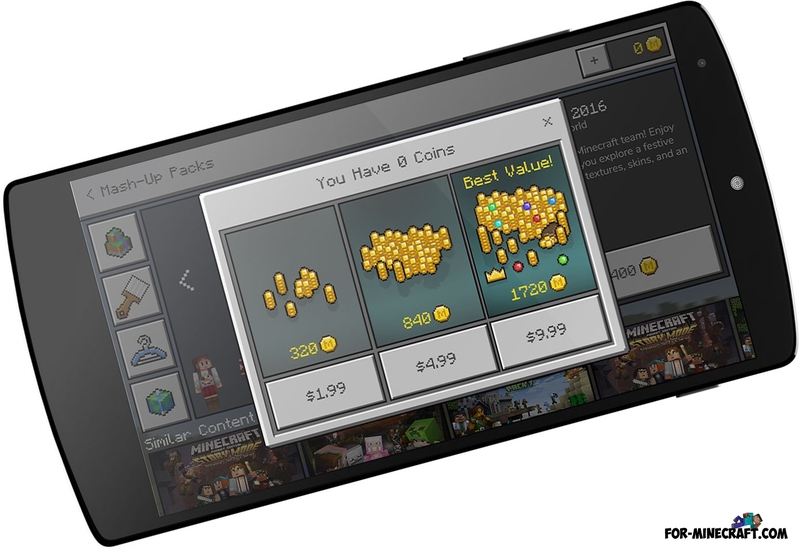 Monetization of Minecraft PE is a separate huge topic that can not be described in one article. But one thing is certain: the developers tried not to interfere in what the community was doing. All the time Mojang acted as a kind of regulator, limiting or approving the activities of creators. Even when developers directly used the work of content creators, their gratitude was expressed intangible: in advertising the authors' web resources and / or issuing exclusive capes. So Realms map creators receive different capes and mention resources (usually YouTube channels). 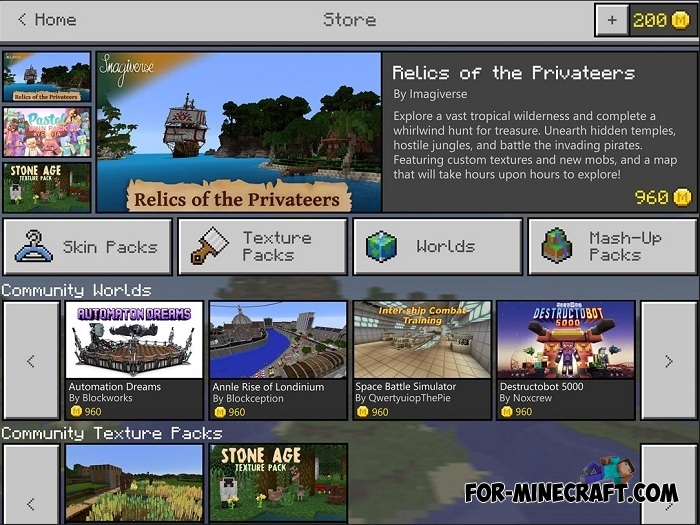 The creation of servers, the programming of plugins and mods, mapping, video and blogging existed parallel to Minecraft, and the developers did not pay attention to that activity until it interfered with their plans. And now, there is a place for creators of content in the financial plans of Minecraft developers. The basic idea is simple, which the developers try to convey to us. They take care of the players and the creative part of the community, creating a marketplace in the game. - Microsoft receives an additional commission from each sale. This is not stated in the press release, however it is quite obvious. Is everyone winning? Most likely this is so, but let's first understand the conditions of the program. The platform must be compatible with Minecraft Pocket Edition and provide access to the Xbox Live network. The current list of platforms looks like this: Windows 10, Android, iOS, Apple TV, Gear VR, Oculus and Amazon Kindle. Do not be surprised if it turns out that now the developers are working hard to support the worlds and addons from Minecraft Pocket Edition. Who can become a Minecraft partner? - Businessmen can become Minecraft's partners only. - Proven authors can become partners only. In addition to these requirements, the work of partners will also be moderated. That is, the curators of the partner program will not approve your work, then it will not go to the marketplace. Absence of confusion with exchange rates. By the way, donate services on MCPE servers could become another interesting use of coins. I would not be surprised if large gaming networks, such as Hypixel or Mineplex will allow their players to pay for services with Minecraft coins. - It was forbidden to use MC buildings in advertising to ensure the uniqueness of the brand. How much can you earn in the marketplace? Of course, it is quite difficult to calculate how much you can earn in the marketplace. I will look at the number of downloads of popular resources for PC version of Minecraft on Curse. Based on the data, you can calculate the average number of downloads per month. At the same time, we will assume that only 0.5% of users would agree to buy this content while others would pass by. Well, the sale price is set to $ 2, this is the minimum price which is now found in the Minecraft store. In general, new sets of skins and resources are quite expensive, but it seems that with an increase in the number of authors there should be competition, so prices may decrease. There is no content for Minecraft Pocket Edition, this is basically the resources for Java version of MC which now occupy a leading position on CurseForge. I want to explain at once that these amounts can be completely different. It is very difficult to guess whether players will buy this content or not.